Hello all. 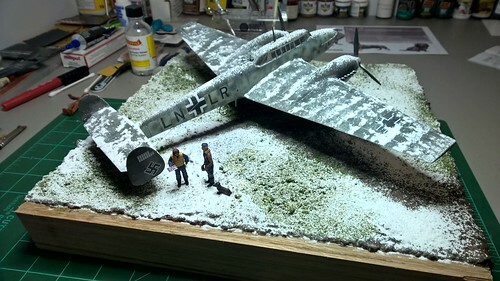 Would anyone have any good ideas for a winter diorama/base? 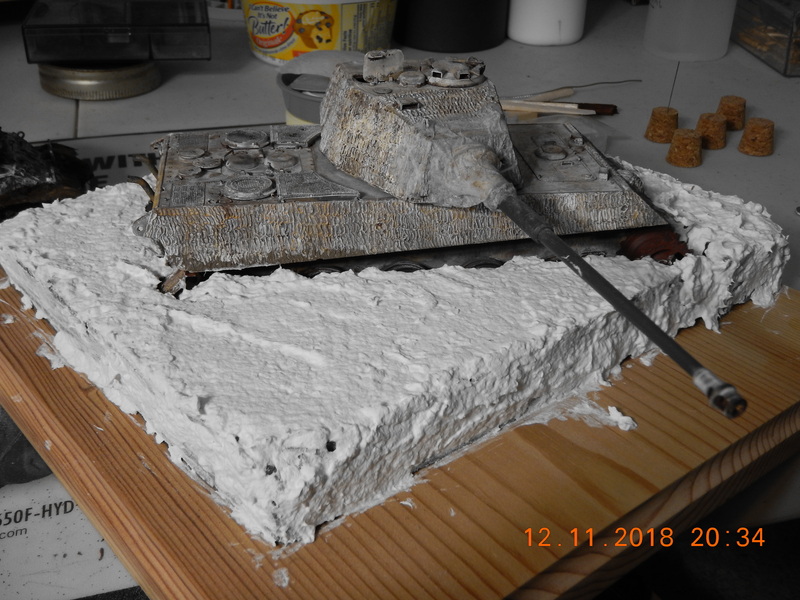 I've built academy Tiger II and want to put it in a winter base, dug in. Any ideas/tips would be greatly appreciated. I recently started useing krycell from procision ice and snow, i really like this stuff. I would check referance pics, a dug in Tiger II sounds a bit unrealistic to me. 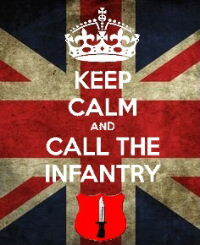 Are you going for eastern or Western front. 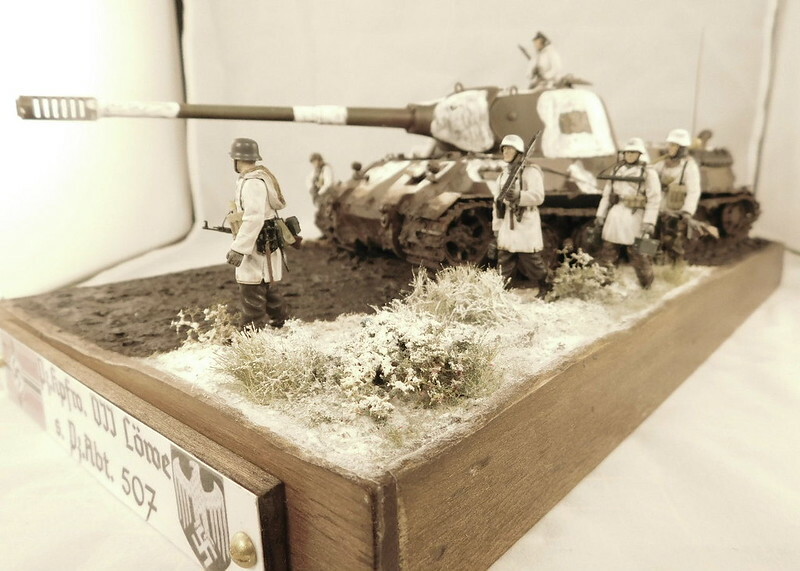 I'm going to not base it on any period photos, just for practice making dioramas. Would there be any tips on groundwork under the snow layer????? Oh wow, I've used the 'snow' stuff for model railroads (Woodland Scenics I believe) but those micro-ballons and Krycell snow material look waaaaaaaaayyyyyyyy better!!! I'm not sure I'd do the groundwork any differently than normally. If everything is being covered by snow just do mounds for drifts with plaster or paper mache. If just a light dusting of snow just do the static grass normally and sprinkle the snow material over it. So where do you find this Krycell stuff? Never heard of it. I've been thinking of doing a dio with either a Spitfire, Lightning P-38 or Lancaster bomber. As far as i know it sold by just one company, Precision ice and snow. They are UK based and i am not aware of any other supplies. They do a whole range of winter products including sheets of ice, a white wash paint which i used on the Lowe above, snow wash and some other items. I am the same, i just do the ground work as i would for any other base. Well actually they have 1 supplier in the u.s. It's http://www.thescenicfactory.com/product_p/snk-01.htm so there is a place to get it. where I got mine at, they also have amazing looking pine trees good for a winter dio. You could do anything for the ground work, really depends where your vision is.. Where is it at? For regular grass,woods I like using sifted dirt as my ground layer or if you don't have access to any dirt you can use grout for dirt. I use celluclay with i add paint to when i mix it. Then just cover with grass, bushes, and anything else. Well, here is the almost finished dio. Just what should I use to secure the snow so it doesn't keep falling off the base??????????? What are you using for snow? If it's krycell then spray a layer of hairspray down first then sprinkle the snow on top of it. If it's just sitting loose then you may want to reclaim as much as you can and start over or try to spray over it with the hairspray and hope it doesn't fly everywhere. Hi Rambo In reguards to the snow. I used woodland scenics soft flake snow. Then I would still suggest the same thing, put down a layer of clear flat or hairspray then sprinkle the snow over that working in layers. Don't do one thick layer but three or four thin layers. I found on krycell that hairspray works the best not sure about that brand. What do you use to apply the product,and where can you buy it? Hi fussionboy! 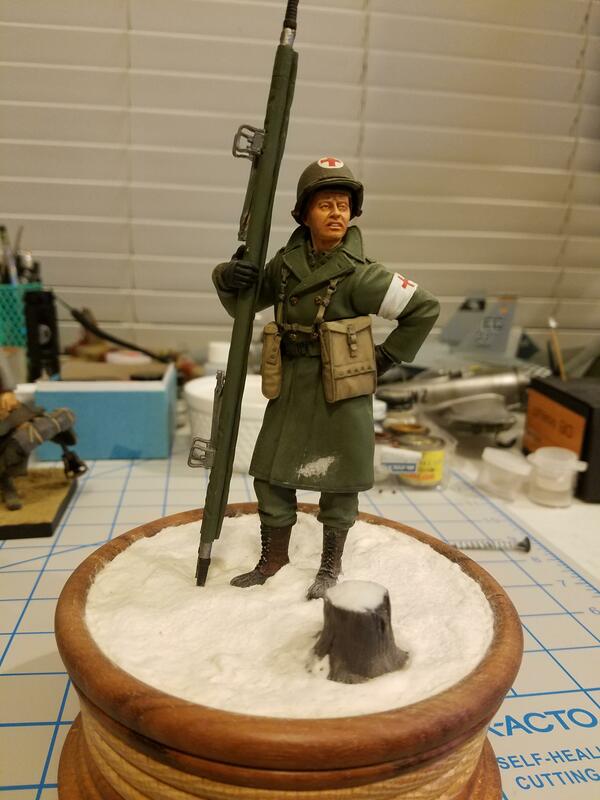 In regards to the snow, it is woodland scenics soft flake snow. You can buy it anywhere there products are sold. I got mine off amazon. 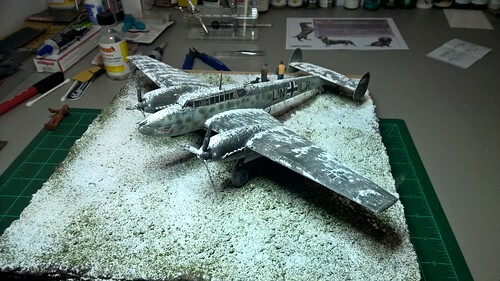 You can use a solution of watered down white glue spritzed over the surface but it will probably ruin the fluffy snow effect. You're better off using the hair spray as Rambo suggested. Though for a thicker coat you might use the white glue on the lower layers and the hair spray for the upper ones.